All work and no play, makes Brett a dull boy. All work and no play is Harley’s standard operating procedure. On this week’s episode, Harley and Brett work their way through the maze that is the Stanley Hotel in beautiful Estes Park, CO. This oddity is one of our favorites. It starts with the beautiful Colorado Rockies, gets the Stephen King treatment, throw in a dash of Stanley Kubrick and a pinch of Jack Nicholson and you have one creepy winter treat. 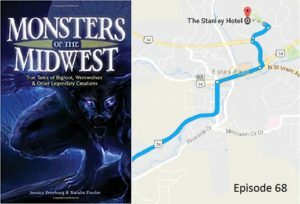 We had a great interview with Natalie Fowler, co-author of Monster’s of the Midwest: True Tales of Bigfoot, Werewolves, and other legendary Creatures. On top of being an author, Natalie is also a paranormal investigator and researcher for Ghost Stories Ink. Natalie explains how one accidentally goes on a ghost hunt, and her experience at The Stanley Hotel. In The News: Alien spacecraft flashing the earth…space flashers? We discuss Estes Park, CO. If you go, there will not be a shortage of beautiful vistas and nature at it’s finest. No Episode of the Travel Oddities Podcast would be complete without a place to grab a bite, and we think awesome burgers that are inexpensive are the best burgers. Brett’s Top 5 is “high”ly informative.